Happy Galentine's Day, you opalescent tree shark! 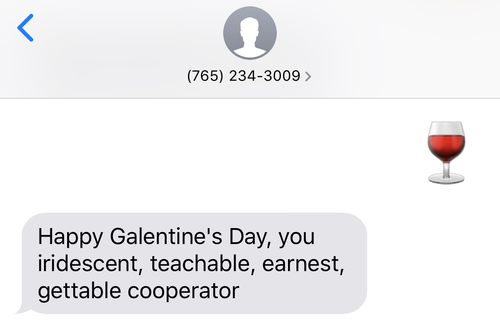 The holiday dedicated to waffles and your best gal-pals only happens once a year, so I built an SMS-based bot that can generate compliments Leslie Knope would be proud of anytime. Send a text to (765) 234-3009 for a preview of what we're going to build in this short tutorial. If you're new to Python and Flask check out this handy guide for more information on getting started. We also need to install Flask to respond to incoming web requests. Try running the app to generate your first compliment! I got dignified, talented, sociable, easy-peasy jester! Next instantiate the Flask app and create a route. Add the following code to compliment.py. Run the following command from terminal in the directory you'll put your code in. That publicly-accessible ngrok URL to our Flask app needs to be used when a message is sent to our Twilio number. Keep ngrok running in a separate terminal window while you're developing the application. Heads up: if you need to restart ngrok you'll be assigned a new Forwarding URL. For Twilio to know how to respond to incoming messages, you need to configure your Twilio phone number to call your webhook URL whenever a new message comes in. Log into Twilio.com and go to the Console’s Numbers page. Find the Messaging section. The default “CONFIGURE WITH” is what you’ll need: “Webhooks/TwiML”. In the “A MESSAGE COMES IN” section, select “Webhook” and paste in your ngrok URL plus /sms. Save your changes – you’re ready! As long as your localhost and the Ngrok servers are up and running, we’re ready for the fun part – testing our new compliment generator! You can also download the finished code for this project on my GitHub. The low overhead of SMS makes bots easy to share with friends and family and show off what you’ve built. If you have any questions or what to share your bot leave me a comment or find me on Twitter. I can’t wait to see what you build! Digging Through A Treasure Trove of FiveThirtyEight Data in Python!